In 1979, physicist Freeman Dyson, in his characteristically prescient manner, proposed the deliberate, large-scale introduction of such fine particles into the upper atmosphere to offset global warming, which he thought even then would eventually become a human concern. Some of my colleagues and I have recently surveyed the current technological prospects for such an introduction. We estimated the costs involved and presented our results last August at the Twenty-second International Seminar on Planetary Emergencies. The most expensive such “geoengineering” option appears to be the one long ago proposed by Mr. Dyson, which may cost as much as $1 billion a year. More technologically advanced options along the same lines might cost $100 million. “Perhaps one of the surprises of this analysis is the relatively low costs at which some of the geoengineering options might be implemented.” Indeed, the director of the U.S. Global Change Research Program’s Coordination Office has been promoting such geoengineering for three decades. But for some reason, this option isn’t as fashionable as all-out war on fossil fuels and the people who use them. Yet if the politics of global warming require that “something must be done” while we still don’t know whether anything really needs to be done–let alone what exactly–let us play to our uniquely American strengths in innovation and technology to offset any global warming by the least costly means possible. While scientists continue research into any global climatic effects of greenhouse gases, we ought to study ways to offset any possible ill effects. 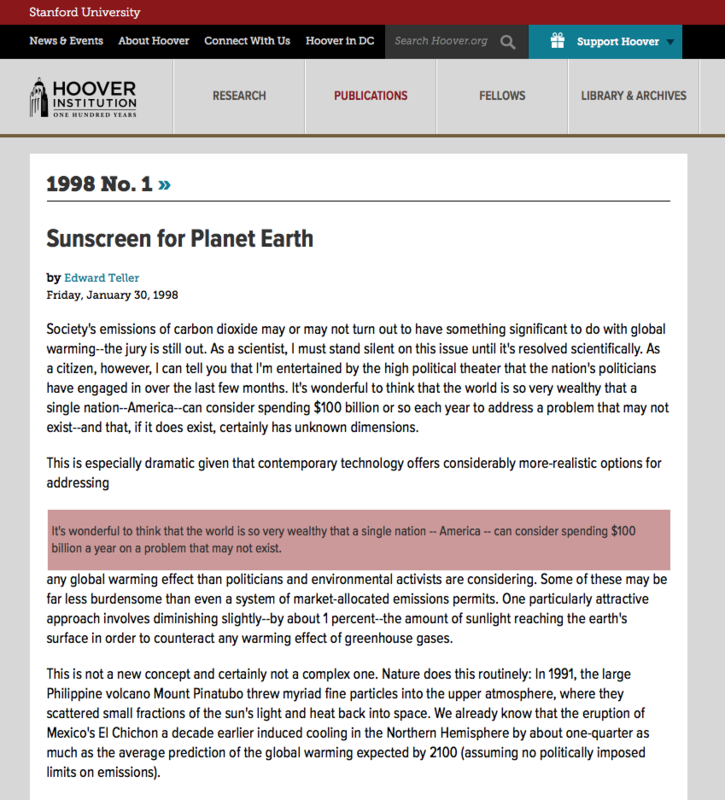 Reprinted from the Wall Street Journal, October 17, 1997, from an article titled “The Planet Needs a Sunscreen.” Used with permission. © 1997 Dow Jones & Company, Inc. All rights reserved.